In Paris, during the 1860s, a group of artists, eventually labeled as Impressionists, changed the way we look at art — and the world in general. Inspired by their distaste for art world’s status quo at the time, these talented individuals ignored typical painting techniques and showed us what the world looked like from their perspective. In doing so they showed us that it’s possible to see the beauty, the joys and the simplicities of life in so many different ways. And that’s just what our NEW Impressions bedding set will do for you. Everything looks different with new perspective. Tired decor, monotonous routines and the limitations we live with can all be changed with the right color, tone and attitude. The impressionists saw a world full of restrictions. Restrictions that kept them from growing into fully realized and satisfied human beings. This new design is all about removing those restrictions, clearing the barriers (mental and physical) that keep you from enjoying every single moment to the fullest and finding something to be joyful about every day. 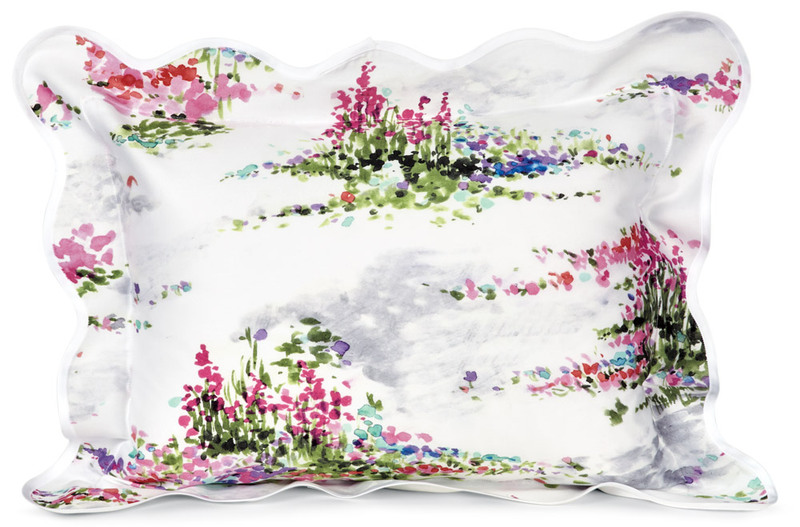 Reminiscent of a Monet painting you’d see hanging in the Louvre, the graceful floral design is finessed with the same masterful treatment of shadow and light as the impressionist masters used themselves. Delicately wild flowers flourish through a dazzling mist of softening daylight. Gazing into the flora is like losing oneself deeply in the water’s reflection and watching nature play fondly with its spectrum of colors including verdant greens, bursts of magenta, rich purples and slender touches of delicate blues. One thing is for certain, the absence of defined lines and contours and the brilliant focus on life’s major components and single parts feels instantly freeing. It’s easy to understand why these kinds of paintings bring people so much peace and happiness. The shades and hues penetrate the mind and senses and each stroke floats serenely along the scene, as if the world never seemed more perfectly in place. 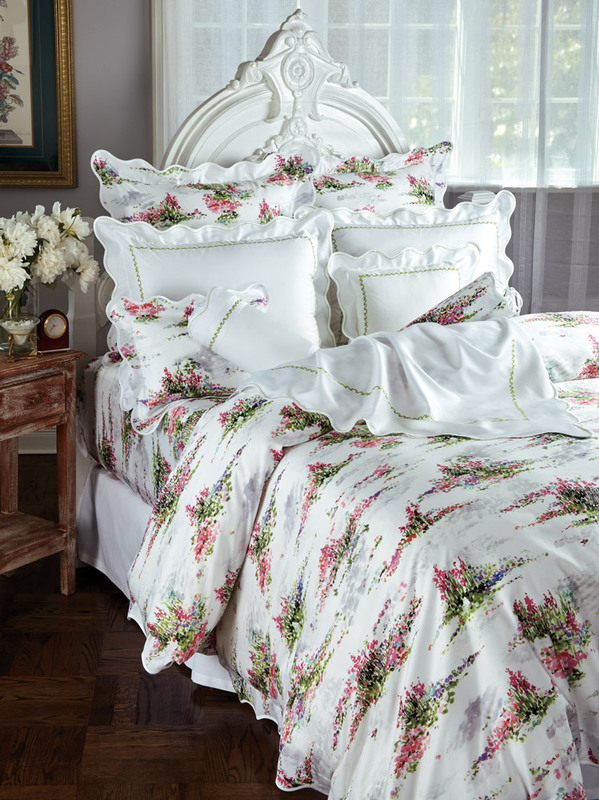 This uplifting and exclusive design is laid down on a canvas of 300-count 100% Egyptian cotton sateen. Made in Italy for your pleasure, the fabric is soft, breathable and suitable for any season. Plus, the supple texture is an absolute joy when it comes to sleeping comfort or just recharging. 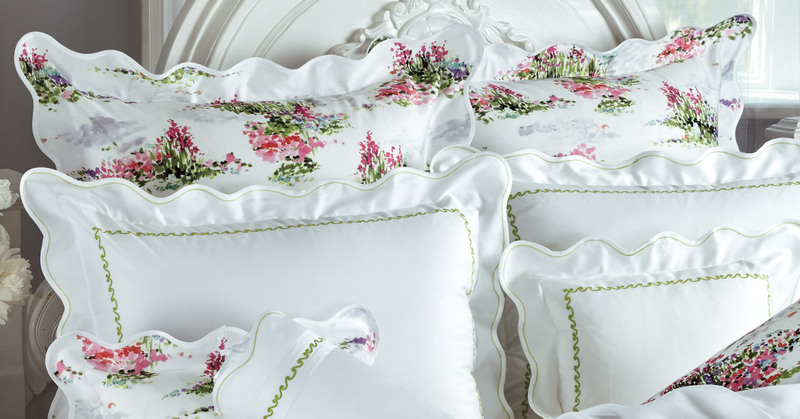 Exquisitely taped scalloped edges surround the magnificent display in a frame of decorative elegance that makes this bedding a bonafide masterpiece. The culmination of every element feels special and uniquely yours. Like the name suggests, this design is sure to make a great impression from day one. It’s certainly made one on us. For over 48 years, our family has been crafting premium bedding to help our customers see their homes in a new light, to find joy in every day and to savor all of life’s moments, all for a great value. This might be one of our most exciting sets yet which is why we’re so excited to share it with you and your family.